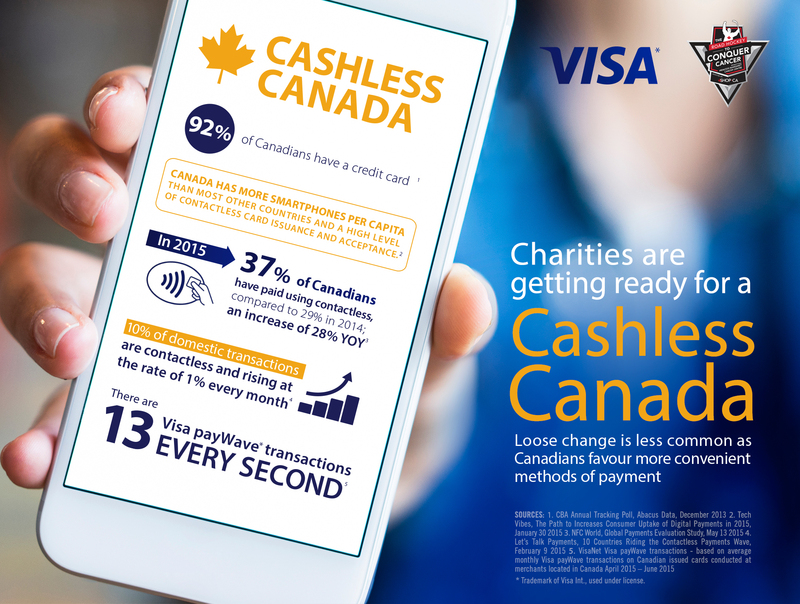 TORONTO, ON–(Marketwired – September 26, 2015) – Today, Visa Canada and The Princess Margaret Cancer Foundation teamed up for a pilot project that enables the first contactless donations in Canadian fundraising history using a standalone smartphone. Armed with Mobeewave technology-enabled phones backed by Global Payments, Foundation staff is collecting donations from players re-registering for next year’s tournament at the annual Road Hockey to Conquer Cancer tournament at Toronto’s Woodbine Race Track. Unlike other mobile point of sale solutions that require add-on equipment (i.e. a reader or dongle), Mobeewave’s technology fully and securely converts a standalone, commercially-available NFC (near field communication) smartphone into a mobile payment acceptance terminal using only software. 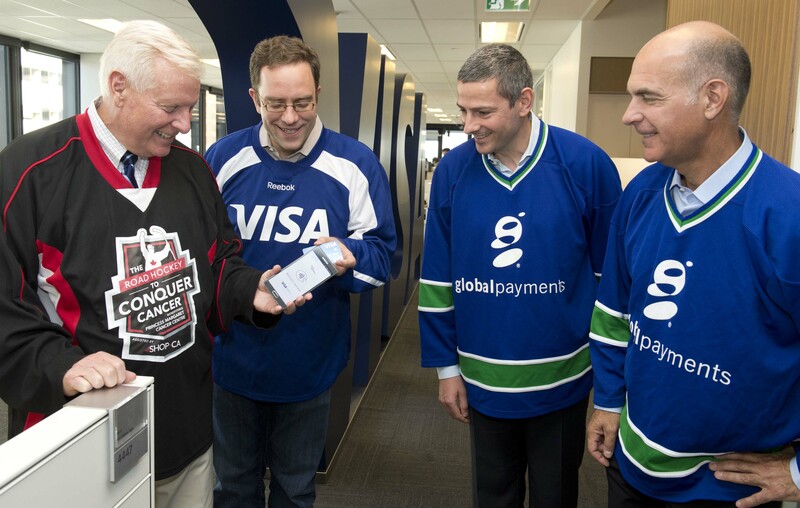 Supported by Global Payments, the pilot project accepts and securely processes payments from Visa payWave contactless cards and wallets. The pilot project is taking place at the Road Hockey to Conquer Cancer event, which runs from dawn to dusk at Woodbine Racetrack in Toronto. The event features more than one hundred teams and thousands of participants playing five games of road hockey each with family and fans cheering on the sidelines. Through the previous four years in which the event has taken place, more than $9 million has been raised for cancer research at the Princess Margaret Cancer Centre, one of the top five cancer research centres in the world. Visa Inc. (NYSE: V) is a global payments technology company that connects consumers, businesses, financial institutions, and governments in more than 200 countries and territories to fast, secure and reliable electronic payments. We operate one of the world’s most advanced processing networks — VisaNet — that is capable of handling more than 56,000 transaction messages a second, with fraud protection for consumers and assured payment for merchants. Visa is not a bank and does not issue cards, extend credit or set rates and fees for consumers. Visa’s innovations, however, enable its financial institution customers to offer consumers more choices: pay now with debit, pay ahead of time with prepaid or pay later with credit products. For more information, visit corporate.visa.com and @VisaNewsCA. Global Payments Inc. is a leading worldwide provider of payment technology services that delivers innovative solutions driven by customer needs globally. Our partnerships, technologies and employee expertise enable us to provide a broad range of products and services that allow our customers to accept all payment types across a variety of distribution channels in many markets around the world. Mobeewave is the world’s first and only add-on-free mobile payment acceptance solution. Our patented technology turns an NFC mobile phone into a secure, contactless payment acceptance terminal, able to securely receive payment transactions made with contactless cards and wallets (including Apple Pay, Samsung Pay, HCE…). Mobeewave provides the highest level of payment security, using Point-to-Point Encryption, and is EMV- compliant. For more information, please visit www.mobeewave.com.